Last night, I finally caught up to episode 7 of Kure-nai, and I figured this would be a good time to introduce a series of mid-season reflections on various shows so far. Kure-nai continues its mix of gangster action and the antics of this season’s most realistic 7 year old. Two scenes stand out to me as emblematic of this show so far. 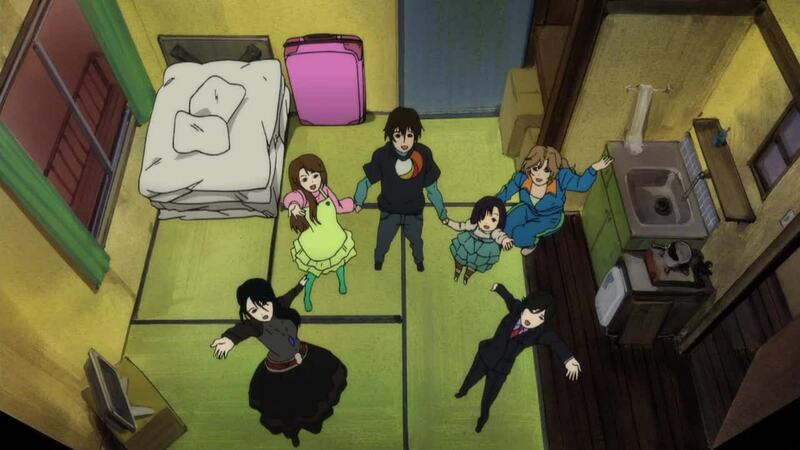 One is a simple, probably overlooked, episode that takes place after Murasaki and Shinkurou leave Yuuno’s house. 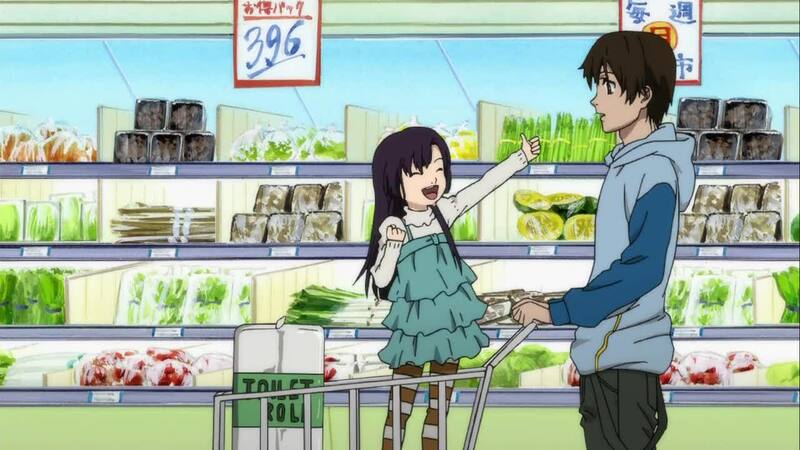 Murasaki is sitting in grocery shopping cart, and she is depressed as she imagines she has made Shinkurou angry. Her mood recovers almost immediately when Shinkurou informs her that he fixed Chizuru’s doll, and, considering she also broke Chizuru’s DS, has the gall to ask Shinkurou for one of her own too. When he finally gives in by warning her “you can only play two hours a day” and that she has to take care of it, she promises this almost thoughtlessly (they are almost certainly not going to be kept), and ends the scene by pumping her arm in a triumphant “Oh, yes!” in imitation of a TV star. I was like that at age 7. The writers captured so very well the turn-on-a-dime mood swings of a child, the making of hasty promises, the way kids imitate things on TV, and the power of toys to bring temporary joy. It does this in less than one minute. It’s a testament to how Murasaki is no ordinary anime loli, especially when the show itself pokes fun at Shinkurou for being a lolicon. The writing is simply of a different order altogether. 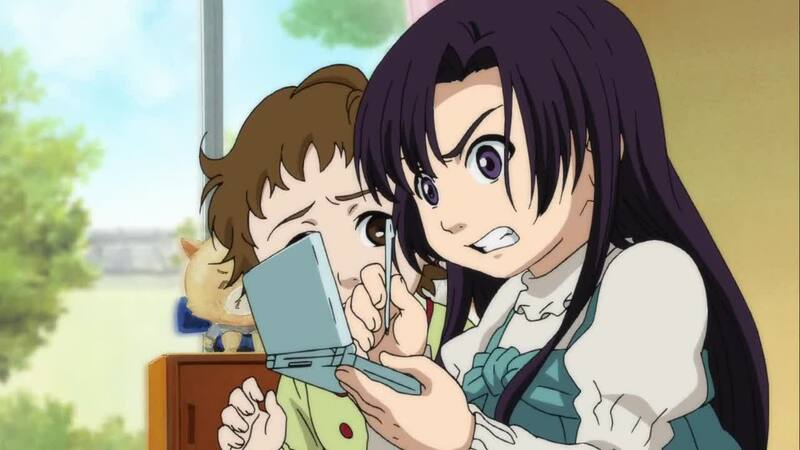 Murasaki sees through pretense, is selfish and spoiled, stands up to do the right thing (not necessarily at the right time–but always exposing Shinkurou’s cowardice, which needs to be the subject of another article in the future), and has no regard for the possessions of others. That’s a kid, folks: aggravating and endearing at all once. One wonders whether the show really should be called Murasaki instead. Shinkurou Kurenai seems like he’s mostly an accessory for her. 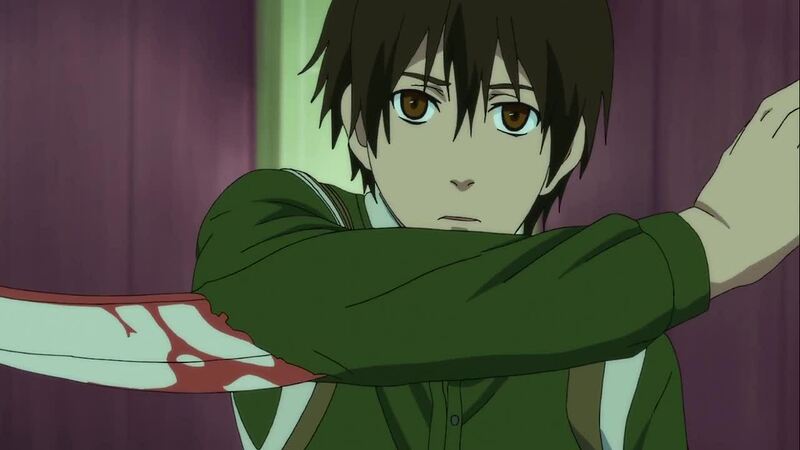 There’s still a part of me that has a hard time believing that a teenage guy could ever be a menacing, convincing “dispute mediator”–even with his implanted arm scythe–but the characters are charming enough to help me suspend disbelief most of the time. So far, then, Kure-nai has managed to maintain its unique elements going with little loss of enjoyment. The problem now is whether the “main plot” is going to turn the show much more mundane; much more of a chase show than a group of amusing, interesting people doing things together. This is where the rather complicated premise of the show may become a drag on the show’s greatest strengths, especially if they’re only limiting this to 12-13 episodes. I like these people. I want to see them go on. It’s why the American version of The Office was able to continue in length far beyond the short, sweet, and surprisingly moving British original. I’m reminded of the advice I was given in creative writing: develop your characters well first. Interesting people create interesting stories all by themselves.